The Lasithi Plateau (Οροπέδιο Λασιθίου) is approximately 70 kilometers from the capital of Crete - Heraklion . The average height at which the terrain of this plateau is located is 840 m above sea level. This makes it one of the highest, permanently inhabited places in the area of ​​the Mediterranean basin. Visitors to this place may be surprised by what the Lasithi Plateau looks like. After a breakneck climb along a winding mountain road, the destination is a flat "cake" with an area of ​​about 25 km2, which on each side is surrounded by steep slopes clearly marking its boundaries. A patchwork of arable fields adjacent to the harsh mountain vegetation completes the rest of the surprising view that the Lasithi plateau represents. Placing such intensive agricultural crops here is not a coincidence. The alluvial sewage of the melting snow that flows into Lasithi every year, naturally fertilizes the soil of this place. Sludges accumulated over thousands of years make this plateau one of the most fertile regions of Crete. Already in Neolithic times, people enjoyed the benefits of this place, but the first permanent residents of the Lasithi plateau were the Minoans and the Djires. The continuous uninterrupted development of agriculture in this area continued uninterruptedly until 1293, when the occupying Venetians of Crete forbade to stay and live on the Lasithi Plateau. This ban, for over 200 years, was the result of problems that the inhabitants of the plateau caused to the Venetians. Strong resistance and frequent exploding rebellions caused that the villages located in Lasithi were completely destroyed, banned all crops, and the inhabitants were resettled in other parts of Crete. It was not until the beginning of the 15th century that the Venetians allowed Greek refugees from the Peloponnese to settle here. During this period, a system of irrigation channels was also built, which are used to this day. Until recently, the water distribution system was based on wind powered pumps. At the peak of Lasithi Plateau, its canvas sails spread even up to 10,000 windmills. Unfortunately, they are increasingly displaced by electric and combustion engines being the source of propulsion for the majority of currently used water pumps. According to some estimates, around 1,500 are still used today. windmills. Coming from Heraklion it is possible to exit the New National Road at the height of Hersonissos or Stalida . In both cases, the road leads to the same pass, which allows you to travel to the northern edge of the plateau. If the journey takes you from the direction of Agios Nikolaos , then it is more convenient to take the exit from the New National Road to Naples. Then, going through such places as Zenia, Exo Potami, or Russakiana, it enters the Lasithi plateau in its eastern part. The main advantage of this place are the amazing views that extend from the pass leading to the tan plateau. In the area around the village of Psychoro, there is the Dikte cave , which according to Greek mythology is the birthplace of Zeus. In the case of arriving or returning by road connecting the Lasithi plateau with Heraklion, it is worth stopping at 24 windmills located near Kera. These mills come from 1800 and were used until the end of World War II. Unfortunately, most of them have now fallen into disrepair, and only 3 have been restored to their former appearance. Nida is one of the largest plateaus in Crete. It is located at an altitude of about 1400m above sea level. Currently, access to this place is not the slightest problem. Behind the village of Anogia begins a comfortable asphalt road that leads through one of the pass and enters the plateau area. Due to the high altitude on which this place is located, the temperature is much lower than on the coast of Crete. Omalos is a perfect starting point for exploring the Samaria Gorge. Located over 1100 m above sea level, it extends over an area of ​​25 km2. This plateau is surrounded by the Lefka Ori mountain range (White Mountains). The local Greeks use this place to grow cereals, potatoes and grazing sheep and goats. In the past, during the Turkish occupation, this plateau served as a refuge for the then rebels. Redirected from the site - Xyloskalo. 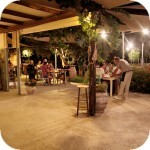 Omalos is a perfect starting point for exploring the Samaria Gorge. Located over 1100 m above sea level, it extends over an area of ​​25 km2. This plateau is surrounded by the Lefka Ori mountain range (White Mountains). The local Greeks use this place to grow cereals, potatoes and grazing sheep and goats. In the past, during the Turkish occupation, this plateau served as a refuge for the then rebels.